The Kansas Foreign-For-Profit Corporation Application | Form FA 51-03 is the first step to operating a For Profit Corporation in the State of Kansas as foreign corporation. Foreign entities wishing to operate as such a corporation must undergo the application process set forth by the Kansas Secretary of State in order to form in compliance with state law. This application must be filled out then mailed to the Secretary of State with the appropriate paperwork and full payment of the filing fee ($115.00). That is, a Certificate of Good Standing or Existence must accompany this application. The Certificate of Good Standing or the Certificate of Existence being submitted must be issued by the domicile state authority of the applying foreign entity, wishing to operate in Kansas, within 90 days of the submission date of the Foreign-For-Profit Corporation Application. This may be submitted by mail to Kansas Office of the Secretary of State, Memorial Hall 1st Floor, 120 S.W. 10th Avenue, Topeka KS 66612-1594. It should be noted that, in the State of Kansas, foreign corporations must use their True Name unless there is a conflict between Kansas State requirements. 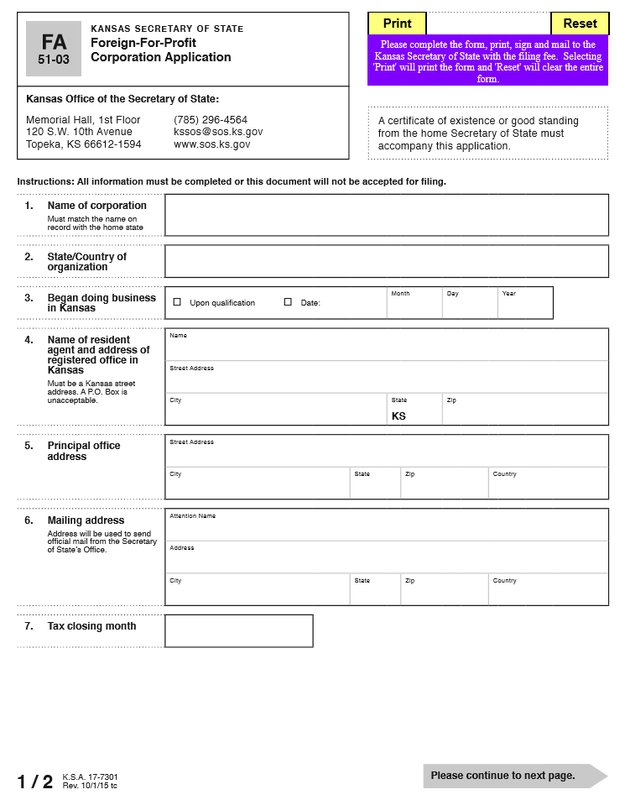 If the True Name is taken in the State of Kansas by another entity, this application must be accompanied by a Letter of Consent from the Kansas Business Entity controlling the Corporate Name. This Letter of Consent must be issued by an Officer authorized by the Kansas Business Entity to issue consent for this purpose. If this is not possible, the filing entity must submit a letter verifying that it will include and list the name of its Home State as both a means of identification and for all advertising methods and media in the State of Kansas. Step 1 - In Item 1, enter the Full True Name of the Corporation. This must appear exactly as it does on the Certificate of Existence or Good Standing issued by the entity’s home state. Step 2 - In the next item, “State/Country of organization” report the Home State/Country of the foreign entity. This should be a report on the jurisdiction that holds authority over this entity’s actions and existence. Step 3 - Item 3 needs a definition of the exact Date this corporation has or will conduct business in the State of Kansas. If this corporation will begin to transact business at the time this application has been successfully filed, then mark the first check box (labeled “Upon Qualification”. If this entity has operated in the State of Kansas then you report the specific Date this first occurred. To do this, place a check mark in the box labeled “Date” then enter the Date in the boxes labeled Month, Day, and Year. Note: if this corporation has been conducting business for longer than six months it may be responsible for providing annual reports amongst other consequences. Step 4 - In Item 4, the Name of the Registered Agent for this corporation is required in the first row. The second row will require the phyiscal Street Address of the Registered Agent. Similarly, the City and State of the Registered Agent should be entered in the third row. The Registered Agent must be located in the State of Kansas in order to be considered a reliable receiver of service of process documents on behalf of the corporation in the event it is sued. Step 5 - In Item 5, the location of the Principal Office Address must be documented for the Secretary of State. Enter the Street Address in the first row. Then, on the second row, fill in the information for each labeled box (City, State, Zip, and Country). Make sure these two lines are the accurate physical Street Address of the corporation’s Principal Office. Step 6 - In Item 6, enter the Mailing Address of the Corporation the Secretary of State should use to send official documents. On the first row, enter the Contact’s Name for this purpose in the box labeled “Attention Name.” Then on the second row, enter the Mailing Address. Next on the third row, enter the City, State, Zip Code, and Country of the Mailing Address in the appropriately labeled boxes. Step 7 - In Item 7, enter the Tax Closing Month for the foregin corporation. Step 8 - In Item 8, there will be a space provided to report the nature, character, and purpose of the business to be conducted in the State of Kansas by this corporation. Be very specific and avoid generalizations. Step 9 - Item 9 shall bind the corporation’s behavior to being answerable in a court of law in the State of Kansas. Step 10 - Item 10 solidifies this corporation will operate as a foreign for profit in the State of Kansas. Step 11 - In Item 11 define the life span of this corporation. If there is no specified Date of Dissolution then mark the box labeled “Perpetual” but if there is a set Date of Dissolution, mark the box labeled “Date corporation will cease,” then enter this Date in the boxes provided (Month, Day, Year). Step 12 - Item 12 shall define when this corporation shall begin to transact business in relation to this filing. If it will begin as soon as the articles have been successfully filed then mark the box labeled “Upon filing.” If there is a specific Date (this must be within ninety days of filing these articles) then mark the box labeled “Future effective date” then enter the Date in the boxes provided (Month, Day, Year). Step 13 - The verification statement in Item 13 must be signed by an Authorized Officer of the foreign corporation. This must be a party that has the explicit consent of the foreign corporation to submit these articles and form a foreign for profit corporation in the State of Kansas. The Signature should be provided in the box labeled “Signature of Authorized Officer.” Then in the boxes provided the Date of this Signature must be reported. Do this in the boxes labeled Month, Day, and Year.